The Murray Indians welcomed in their cross town rival the North Murray Mountaineers on Wednesday for a crucial region 6-AAA match up and of course bragging rights. 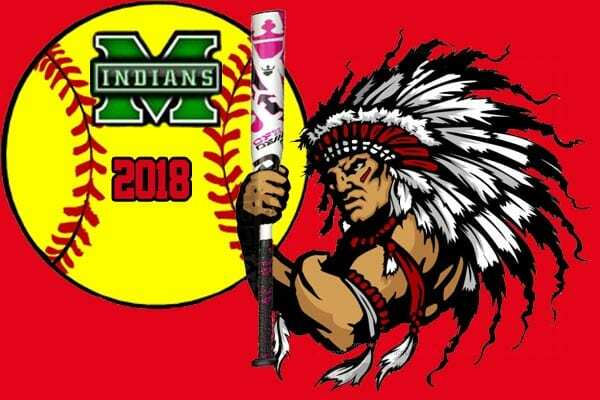 2018 has started off slow for the Indians at 3-13 overall and just 1-10 in region play while the Mountaineers were off to a decent season at 10-8 overall and 6-7 in region play. The Mountaineers took an early lead in the second inning putting up one run on the board by way of a single from Savannah Smith followed by a one out double off the bat of Annabell Ortiz. North would add one more in the third on three singles and a sacrifice. From that point in the game both teams would have a few opportunities to score with no avail. That would change for the Lady Indians in the bottom of the sixth. Maddie Jenkins(single) and Natalie O’Neal(double) along with a sacrifice by Jordan Swanson pushed two runs across. With the Mountaineers still ahead by one going into the seventh, Natalie O’Neal shut down any chances for the Mountaineers to add anything. Murray would also go quietly in their half of the seventh forcin extra innings. Heading in to free softball, North Murray’s McKinley Fields reached on an error to lead off the inning. Three batters later, Kaylee Higgins stepped to the plate with two outs and took an O’Neal pitch deep over the leftfield fence to put the Mountaineers up 4-2 on the board. The Lady Indians would have opportunity in their half of the eighth when Natalie O’Neal doubled on a line drive to left and put herself in scoring position with just one out. The Mountaineers pitcher Talli Burgess was able to sit down the next two batters on strike outs to preserve the victory. At the plate the Indians out hit the Mountaineers 11-9 in the game but fell short where it counts. Stand outs for the Lady Indian were Attie Ridley- 2 for 4, Brooklyn Gonzales- 2 for 4, Rileiegh Morgan- 2 for 4, Maddie Jenkins- 2 for 4 with a run scored and Natalie O’Nealk- 3 for 4. Allison Weaver scored the other run for Murray. O’Neal not only had a good day at the plate but also in the circle. O’Neal went eight innings throwing only 74 pitches. In those she gave up 9 hits, 4 runs(2 earned) 2 strikeouts and no walks. O’Neal gave up one home run. Natalie O’Neal took the loss for the Lady Indians with numbers good enough to win most games. The dagger for Murray was the opposing pitcher. Talli Burgess had a complete game throwing 124 pitches and gave up 2 runs on 11 Lady Indian hits. Burgess had 12 strikeouts and one walk in the victory. Next up for the Murray Lady Indians will be at home as Sonoraville comes to the home field on Thursday for a 5:40 start.